Dawn was fast approaching, as crystal clear and cold as the night itself had been, with a bitter wind which tasted of coming snow. The rare rain of starfalls had slowed to only a rare streak across the sky overhead, and Snowflake paused for a moment to marvel at one greenish streak of light that crossed the dawning. Then it was gone, and Snowflake crawled out of the hometree window, letting the window-covering flap close behind her. She hung for a moment, gauging her fall, then dropped. The thick layer of snow softened her landing, and she gathered herself to her feet like a tree cat, barefoot and shivering from the snow that had gotten under the collar of her winter tunic. Another streak arrowed across the clear winter sky. The movement caught her attention. Snowflake tracked the falling star intently, watching it burns itself out overhead. It was strange to her that the stars were raining, but at least it meant the stars were doing something, when usually they did nothing but crawl so slowly it put you to sleep watching them. She had little use for stars that did nothing; stars that of a sudden raced and turned to silent cinders � those were worth a moment�s attention. But only a moment. Not until a star dropped at her feet and became something she could taste and touch and smell, not until then would it really be worth her interest. The cold was dreadful against her bare feet; her mother had given her winter slippers that would have kept her warm, but Snowflake hated footwear of any sort, and fought to kick her feet free of anything her parents put on her. She wriggled her toes now, then ran, knowing it would be warm again when she had reached her destination. There was a whisper of sound from inside the hometree, and then the window-curtain was yanked aside and a startled face gazed out at the three-year-old child. �Snowflake!� Leather exclaimed, his russet hair loose around his shoulders. He was half-naked, having been pulled out of bed by the disturbance at his window. �See baby!� Snowflake demanded. Leather snatched her inside and tried to bundle her in his body-warmed blanket, but she squirmed violently. �See baby!� she demanded again. Leather dropped her into the padded bowl of the bed, leaving her to burrow her way out of the fur blankets as he lashed the window-curtain shut again. Snowflake kicked free of the blanket, feeling another warm body in the far side of the bed. Stormdancer stirred then, uncharacteristically slow to wake. There was a shifting of bodies; Stormdancer was turning over, carrying a bundle with her, and Leather was moving to envelop them both in a protective embrace. �Snowfall and True Edge had promised you, did they?� Stormdancer said. Her voice sounded washed out, nothing at all like the vibrant glider�s usual throaty purr. �I just sent to Snowfall, told her to come fetch her pup,� Leather murmured. �See baby!� Snowflake showed her teeth, putting the olders on notice that she wouldn�t leave without a fight. Snowflake looked at the round, pink little face and scowled. For two Turns now her kin had been promising her that when Stormdancer and Leather�s new cub was born she�d have a playmate. This lumpy, froggy thing looked more like a stuffed doll than a playmate. The fat lips moved and smacked together, proving the lump was alive. Snowflake leaned closer and sniffed dubiously. �Girl-cub?� she asked. The baby smelled like nothing else in memory � helpless and milky and sweet-sour, with the acrid undertone of the moss-hair lichen swaddling that she remember had felt so itchy of against her own skin. There was something desperate about the baby�s scent, something that hinted at sickness and weakness. Snowflake felt the hairs at her nape prickle in predatory response. Snowflake turned her attention to Leather. If Stormdancer sounded one kind of strange; the tanner sounded something different. His voice was strained, his spoken words strangely sharp-edged. Snowflake could tell something was wrong, but her nose, ears and eyes couldn�t tell her just what. There was a scuff of footsteps on the stairs through the curtained door; moments later, Snowflake caught her mother�s scent. The door curtain was pushed open, and Snowfall slipped into the room. �Snowflake�� her mother said, her expression apologetic. Snowflake let her mother gather her up. She drank in another deep breath, sorting through the scents in an attempt to solve the mystery. Kindly Leather was snap-tongued and Stormdancer, who had been sickly since the end of the summer, sounded and smelled even weaker than she had before the baby was born. And the new cub smelled wrong. And most importantly � this playmate she had been promised didn�t look to Snowflake like she�d prove worth the wait. �Do you need anything?� Snowfall asked the new parents. Snowflake sounded almost too bright and hopeful, so that she sounded like someone else. �No,� Leather said, short and sharp. �Bring Snowflake back here for a moment,� Stormdancer said, at the same time. Snowflake felt her mother�s curiosity as Snowfall did as asked. Snowflake looked down at the bed from the height of her mother�s arms, and wondered where those dark shadows had come from that ringed Stormdancer�s eyes. Stormdancer coughed painfully and held up her swaddled infant again so that Snowflake could see the froggy little face again. Snowflake shifted her dubious stare from the baby to the mother. She didn�t like the baby�s scent � the little mewling creature smelled wrong and weak. But Stormdancer�s dark, shadowed eyes were desperate. Snowflake cocked her head to one side, listening intently, wondering if she had failed to hear a send, or if there was another question asked of her she had not heard. Guardian. That was a word Snowflake liked the taste of. It conjured up images of wolf-friends all fierce-eyed and bristling. Snowflake nodded solemnly, knowing in her bones that *guardian* was good and true and the Way. Stormdancer lay back in her furs. �Thank you, cubling,� she said, her gaunt face pretty for a moment as she gave Snowflake and Snowfall both a serene, grateful smile. Then those haunting dark eyes closed with exhaustion. �My lifemate must rest,� Leather murmured; belatedly, Snowflake recognized what was so strange in her elder�s voice. The tanner was afraid. Deeply afraid. Snowfall nodded and slipped out the door, making sure it was lashed secure behind her. Snowflake wrapped her arms tight around her mother�s neck and stared over Snowfall�s shoulder toward Leather�s den, wondering why the tanner was so frightened of them? �Snowflake, you mustn�t sneak out, not in the freezing cold like this,� Snowfall said as she carried her daughter up the interior of the tree toward their own family�s den. Her breath made fog in the crisp dawning air. �Yes mother,� Snowflake agreed, knowing she would when the behaving meant getting what she wanted. She looked up at the sky overhead, delighting in how the rising sun turned the winter sky all shades of pale yellow and pink. And as she turned her face up to the sky, the last of the night�s falling stars streaked overheard, shining for that bare moment as brilliant and poignant as a mother�s dying wish. The tussle was brief but not bloodless. When Snowflake turned around and found the other child had a hold on Snowflake's new doll, she growled and lunged for it, flashing her teeth in warning. Fadestar recoiled, clutching the doll to her thin chest. Snowflake locked both hands on the toy and yanked, trying to drag the floppy-eared stuffed rabbit free. Fadestar held on. Snowflake pulled again, still growling, and flashed her teeth in warning. Fadestar hung on. "Mine!" the two-year-old protested, dark braids flying as she dragged back. "Mine!" Warning given, Snowflake wrestled the doll closer, leaned in, and sank her teeth into the other child's bare arm. Fadestar shrieked and let the contested toy go. Snowflake retreated to her parents' bed, ignoring the screams of her defeated playmate. She cuddled the doll for a moment, then bored of that, propped it up among the blanket furs and practiced pouncing on it. Behind her, Fadestar's wails scaled the octave. The door-curtain rustled; Snowflake caught Tallow's scent as the crafter hurried into the room and scooped up the weeping child. "Oh kitling, hush, hush..." Snowflake didn't look up until, moments later, she heard her mother's steps approach the door. Snowfall ducked into the room. "What's wrong?" "That cub of yours!" Tallow snapped over the sound of Fadestar's sobs. "She took a bloody chunk out of Fadestar's arm! *Again! *"
Snowflake had learned what would come next. She snatched after her toy and dived for the window. Snowfall was quicker, and dragged her daughter back before escape could be made. "Mine!" Snowflake hoisted her toy, proudly unrepentant. "Mine!" Snowflake took away the stuffed rabbit and deliberately handed it to Fadestar. The younger child clung against Tallow's chest, sniffling now. She refused to take the toy, and turned her enormous eyes away as if frightened of the thing. Tallow took it instead. "You mustn't bite, and you must learn to share," Snowfall said. "A good huntress always shares with the rest of her tribe. A wolfrider always shares. Hear me, cub?" Snowflake heard her mother�s voice, and knew the words were a chastisement, but she also knew she didn�t need to listen. She had no question of her dominant position over the other child � Fadestar was younger, smaller, and always the weaker. They were a tiny pack of two, and Fadestar rightly knew her place in her own pack. Instead, she focused on her toy. Snowflake growled and swiped stubbornly after it, knowing that with persistence came rewards. Fadestar had stopped weeping, and her thin face peeked out from Tallow�s protective arms. Snowflake felt the other child�s shifting gaze, and looked directly at her. Fadestar�s dark eyes dropped submissively, and Snowflake chuffed to herself in satisfaction. They were a pack of two, and both cubs knew it. Finch�s newborn boy was fat, pink-faced, and topped by a welter of tawny curls. Fadestar squealed with delight the moment she saw him and immediately reached out in hopes to getting to hold the round-cheeked bundle. Snowflake was satisfied instead to simply lean close and breath in deep, tasting and categorizing his scent. Milky-sweet and healthy. There was nothing missing, like there was in Fadestar�s weak-prey scent. Fadestar began to cough. The coughing wracked her thin frame; her father hugged her close and rubbed her back until the coughing had passed. Snowflake cocked her head, listening intently. There were times when Fadestar coughed so hard that she could not breath, her lips went blue, and if Snowflake were close enough to her agemate, she could here the strange whispering �shusss� of Fadestar�s laboring heart. There was a hole in Fadestar�s heart, or so Cloudfern tried to explain it � but Snowflake knew her elder must be wrong. You stuck a spear or an arrow in your prey and pierced its heart, and it died. No elf could live with a hole in her heart. �That�s a fine new spear you have there,� Finch said to Snowflake, as Bowflight offered a waterskin to Fadestar and helped the sickly cub to drink. Fadestar frowned and shook her head. �No Not again,� she said miserably. Snowflake made a face, knowing viscerally that it was better by far to be a hunter. That was a truth her own blood sang to her, as undeniable as the moons overhead. �I�m going hunting!� she repeated, determined to prove herself a good provider for the newest member of her pack. �I�d rather go hunting,� Snowflake heard her agemate say, as Snowflake stepped out of the hometree into the crisp night air. **Wait! ** Fadestar sent back desperately. **You keep up! ** Silvermane blasted back, her words shadowed with the image of hunters racing with the full wolfpack. Fadestar continued to fall behind, her face flushed crimson and her lungs rasping. Silvermane kept the pace she had set; it didn�t occur to her to take mercy on her playmate. Silvermane listened to her wolf-heart and knew what she did was right and best. Nature showed no mercy to the weak, and neither did the wolfpack. Mercy from their elders hadn�t cured Fadestar of her lifelong weakness, so Silvermane did as she knew was best: challenge Fadestar to keep up or fall behind, either do or fail. Fadestar struggled to gain ground, arms and knees pumping gamely. But she was unable to keep up the pace, and within a few more strides, the forest swallowed her from sight. Silvermane kept running until she had led her small pack to the riverbank. Then she turned and trotted back down the path they had taken. They found Fadestar where she had tripped and fallen, several hundred paces from the river. Fadestar lay curled in a ball, hugging herself and sobbing for breath. �Get up,� Silvermane said, nudging the other girl with her foot. �Why won�t you ever wait for me?� Fadestar cried. �You�re just mean!� Fadestar wept. Silvermane turned away, already bored of her playmate�s histrionics. �You either are, or you�re not. Crying over it won�t make the rain stop falling, or the river stop flowing. You do, or you don�t. Growler sat and began to scratch. Silvermane leaned against her spear, aware of how quiet the forest had gone around them. Fadestar�s weeping had scared away the birds. There was a flicker of movement overhead; Silvermane glanced that way reflexively and saw a big-eyed tree-wee staring down at them from high up in a cedar, its bushy tail twitching in anxious curiosity. The tree wee wasn�t the only one who heard Fadestar�s tears. Fresh movement from up the trail caught Silvermane�s eye, and she looked that way to see a grey she-wolf loping toward them. It was Moonbrow and her rider. Leather leaped off his wolf-friend�s back and scooped up his daughter, giving Silvermane a fierce look as he gathered his weeping daughter close. Fadestar just wept harder, her sobs so hard now that she was left choking for breath. �Not hurt. Just weak,� Silvermane said. Leather carried his child back to his wolf-friend. He set Fadestar astride Moonbrow�s back. �There are more kinds of strength than you know, wolf-daughter,� he said sternly to Silvermane. Silvermane shrugged dubiously; her elders often said things that made no sense, or that ran contrary to common sense and the Way. It was easier to ignore those contrary statements rather than waste breathe with argument. She turned away as Leather rode off with his daughter; she looked instead for the tree wee, hoping its curiosity had drawn it down within range of her spear. But the tree wee had sense enough to know it was prey. It had fled. Silvermane padded barefoot down the stairs, following her mother down into the warmest of the interior dens. She was bleary-eyed and wrapped in her thickest winter fur, having just been woken from a deep day�s sleep. Mouse was already there, as were Kestrel and the chief and Cloudfern and every other member of the tribe not out on a late-winter hunt with Hunt Leader Blacksnake. They were all crowded into the small, round chamber, and while Silvermane wasn�t surprised to see a little cub like Mouse wet-faced with tears, she was shocked to see several of their elders crying shamelessly. Silvermane was resistant, but other tribemates urged her through the press to Fadestar�s bedside. Fadestar lay motionless among the fur blankets there, her lips almost blue and her fair skin gone translucent. A sheen of fever-sweat glimmered on her skin, and her dark, shadowed eyes were sunken. She seemed to stare through the faces around her, and mumbled feverishly in a one-sided conversation with her father. Silvermane stared at her playmate. Fadestar was always sickly, and her fickle health always took turns for the worse during the winter. But four days ago, the tanner Leather had been crushed to death by a marshbeast bull while hunting. Within hours of learning of her father�s death, Fadestar had come down with a raging fever, and nothing in Cloudfern�s centuries of experience with of herbal treatments could bring her fever down. Silvermane leaned over her playmate and breathed deep. Fadestar�s scent agreed with what Silvermane�s eyes told her. Fadestar was dying, and reeked of it. The smell made the hair at the nape of Silvermane�s neck rise. She shivered and retreated an involuntary step. Silvermane attempted a send to her agemate. She pictured both of them together, as they�d stood during the tribe�s howl for Leather, four nights ago. But reaching Fadestar was difficult; it was like trying to find the girl through a dense, humid fog. When Silvermane succeeded, her playmate�s mindtouch was distant and non-responsive. �Kestrel, I don�t think we can wait any longer,� Cloudfern murmured to the elder. Kestrel nodded, suddenly mute with grief. Cloudfern set a trio of bright-winged Preservers to their task, and the spit-bugs went to work without hesitation. Silvermane retreated back to her mother�s side. 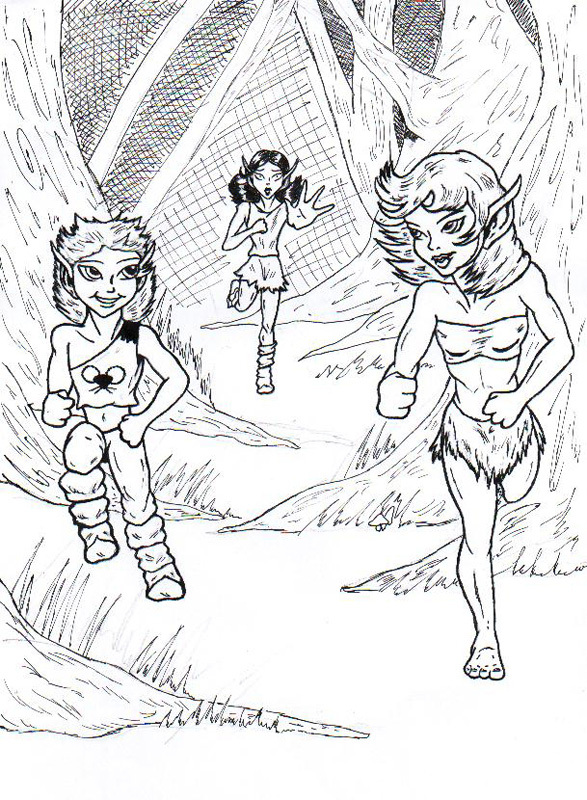 Silvermane watched the Preservers at their work, her ears full of the muted grieving of her tribemates around her. She listened to her own wolf-heart, and knew that this was wrong. Fadestar�s weak heart had been too much elf and too little wolf; postponing Fadestar death until some other daybreak or moonrise was wrong. Suddenly, Silvermane couldn�t continue to watch the Preservers spin their spider-cocoon. She wrenched herself free of her mother�s embrace and pushed her way to the nearest window. No one held her back as she scrambled for escape. The rasp of rough bark against her bare hands and feet was bitterly cold as she climbed free, and the snow was crunching under her bare feet. She hugged her fur blanket tight, and glared up through the winter-bare branches of the Mother Tree, to where the weak winter sun hung balefully overhead. For a confused moment, Silvermane remembered a shooting star against a dark winter sky. But the memory blazed to nothing, like a promise forgotten. Silvermane wiped fiercely against the tears she found in her eyes. Elf ways made no sense, but the wolf in her knew what would comfort. The girl tilted back her head and began to howl.